Hi there! Today I will tell you on the rotation of the asteroid (9021) Fagus. The first determination of its spin period is given in Rotation period determination for asteroid 9021 Fagus, by G. Apostolovska, A. Kostov, Z. Donchev, and E. Vchkova Bebekovska. This study has recently been published in the Bulgarian Astronomical Journal. Its small magnitude explains that its discovery was acknowledged only in 1988. Once identified, it was found on older photographic plates, providing observations from 1973 (yes, you can observe an object before it was discovered… you just do not know that you observed it). This body is so small, that the authors of this study observed it by accident: in 2013, they observed in fact (901) Brunsia during two nights, which is brighter (absolute magnitude: 11.35), but Fagus was in the field. The collected photometric data were supplemented in March 2017 by two other nights of observations, which permitted the authors to determine the spin (rotation) period with enough confidence. I address the measurement of the rotation of an asteroid here. Such a small body may have an irregular shape, and tumble. But since it is very difficult to get accurate data for such a small body, it is commonly assumed that the body rotates around one principal axis, this hypothesis being confronted with the observations. In other words, if you can explain the observations with a rotation around one axis, then you have won. The irregularity of the shape makes that the light flux you record presents temporal variations, i.e. the surface elements you face is changing, so the reflection of the incident Solar light is changing, which means that these variations are correlated with the rotational dynamics. If these variations are dominated by a constant period of oscillation, then you have the rotation period of the asteroid. Typically, the rotation period of the Main-Belt asteroids are a few hours. These numbers are strongly affected by the original dynamics of the planetary nebula, the despinning of the asteroids being very slow. This is a major difference with the planetary satellites, which rotates in a few days since they are locked by the tides raised by their parent planet. For comparison, the spin period of the Moon is 28 days. The weather. A bright sky is always better, preferably with no wind, which induces some seeing, i.e. apparent scintillation of the observed object. The variations of the thickness of the atmosphere during the observation. If your object is at the zenith, then it is pretty good. If it is low in the sky, then its course during the night will involve variations of the thickness of the atmosphere during the observations. Instrumental problems. Usually you use a chip of CCD sensors, these sensors do not have exactly the same response. A way to compensate this is to measure a flat, i.e. the response of the chip to a homogeneous incident light flux. 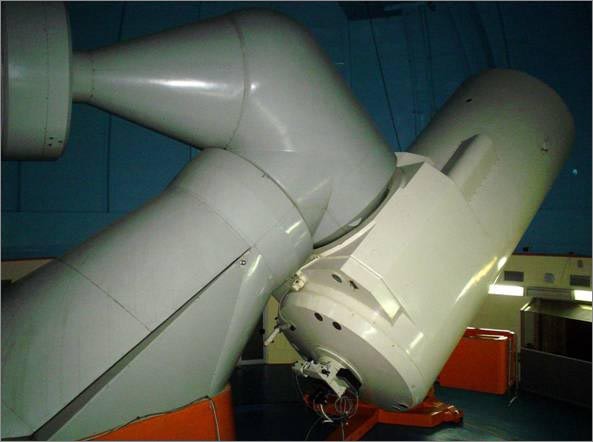 The observation conditions can be optimized, for instance in observing from a mountain area. The observer should also be disciplined, for instance many professional observatories forbid to smoke under the domes. In the past, this caused wrong detections. A good way to secure the photometric results is to have several objects in the fields, and to detect the correlations between their variations of flux. Intrinsic properties of an object would emerge from light variations, which would be detected for this object only. 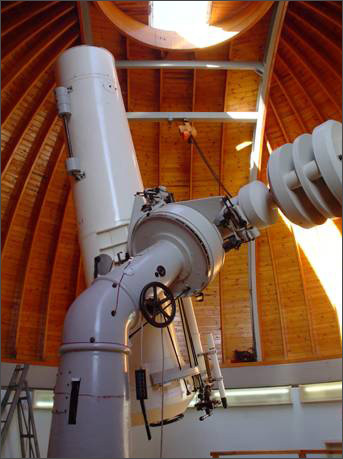 The observations were made at Rozhen Observatory, also known as Bulgarian National Astronomical Observatory. It is located close to Chepelare, Bulgaria, at an altitude of 1,759 m. It consists of 4 telescopes. The 2013 observations were made with a 50/70 cm Schmidt telescope, and the 2017 ones with a 2m-Ritchey-Chrétien-Coude telescope. In both cases, the observations were made through a red filter. The faintness of the asteroid required exposure times between 5 and 6 minutes. The authors used two softwares in their study: CCDPHOT, and MPO Canopus. CCDPHOT is a software running under IDL, which is another software, commonly used to treat astrophysical data, and not only. With CCDPHOT, the authors get the photometric measurements. MPO Canopus could give these measurements as well, but the authors used it for another functionality: it fits a period to the lightcurve, in proving an uncertainty. This is based on a Fourier transform, i.e. a spectral decomposition of the signal. In other words, the lightcurves, with are recorded as a set of pairs (time, lightflux), are transformed into a triplet of (amplitude, frequency, phase), i.e. it is written as a sum of sinusoidal oscillations. If one of these oscillations clearly dominates the signal, then its period is the rotation period of the asteroid. And the result is this: the rotation period of (9021)Fagus is 5.065&pm;0.002 hours. In practice, being accurate on such a number requires to collect data over several times this interval. An ideal night of observation would permit to measure during about 2 periods. Here, data have been collected over 4 nights. Up to now, we had no measurement of the spin period of Fagus, which makes this result original. It not only helps to understand the specific Fagus, but it is also a new data in the catalog of the rotational periods of Main-Belt asteroids. The one of Zahary Donchev. The softwares: CCDPHOT, and MPO Canopus.